Will you travel for performances? 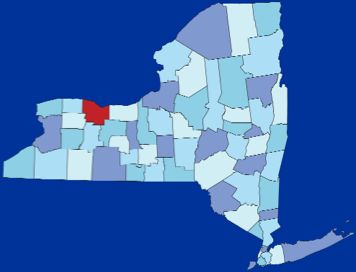 I am based in Rochester, New York, in Monroe County (shown on the map below in red). I am happy to travel within the USA, though, if the costs of the travel are covered. Do you have any CDs? How can I hear your music? You know, I keep saying I need to do a CD, but I’ve been so busy performing that I haven’t found time yet. Soon! 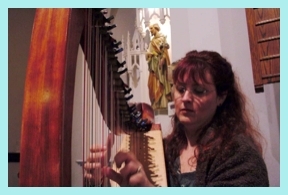 In the meantime, I’m always happy to have you into my harp studio to see and hear the harps in person, and hear the types of music that most interest you. If you can’t come in person, we can have a “virtual meeting” by phone or by Skype. You can also contact me to find out where I might be performing at upcoming public events. 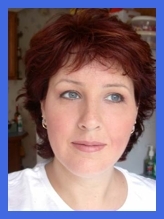 You will also soon be able to listen to sound clips on this website. Will you do outdoor events? Yes, but only in the warm months between Memorial Day and Labor Day. The rest of the time the weather is just too unpredictable in New York. Even during outdoor season, you should have a plan for protecting the harp during inclement weather. Harps absolutely cannot get wet, so you MUST have a rain plan. The temperature outdoors should also be between 60 and 95 degrees Fahrenheit; anything outside of that zone can cause damage to the harps. Amplification outdoors will depend on the availability of electricity, naturally. I do more than a hundred events a year. 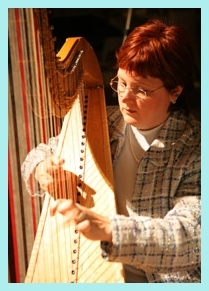 I’ve been playing the harp professionally for nearly twenty years and can refer you to many happy former clients. 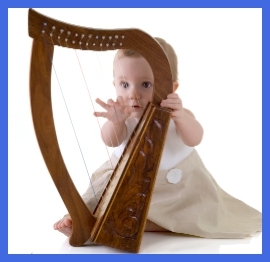 Is harp too quiet to be heard at my event? Event acoustics can vary tremendously based on building construction, outdoor locations, number of guests, etc. Even unamplified, harps can put out a surprising amount of volume! Still, in “acoustically-challenged” locations, they can be amplified. I use state-of-the-art technology to ensure accurate, lush sound quality. I regularly play in large venues such as convention centers for up to a thousand people without difficulty. Do I need to have other instruments along with harp? Nope. The harp is capable of such full voicing that it isn’t necessary to have other instruments play with it to give a rich, satisfying sound. I can easily work with vocalists or other instruments, however, to create lovely ensembles. 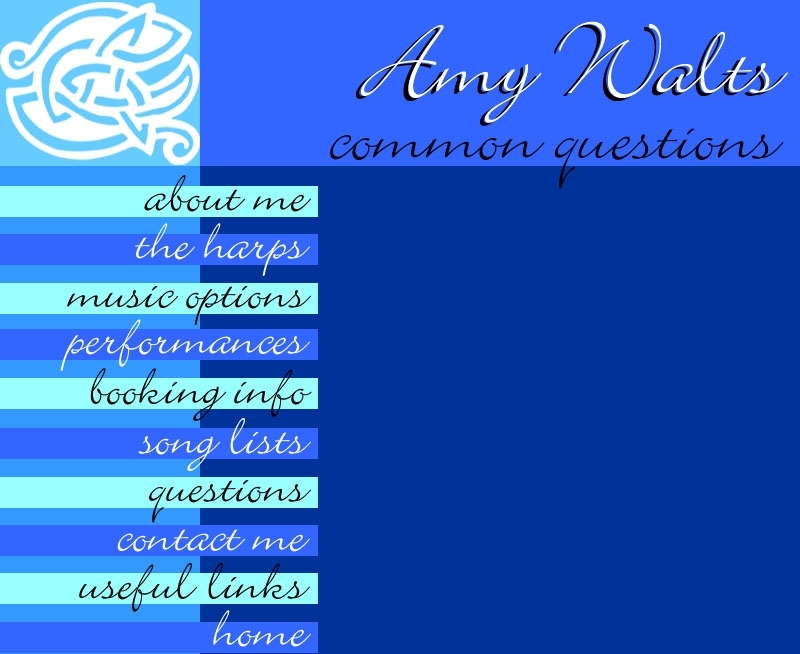 Does the harp need to come to my wedding rehearsal? Generally speaking, no. Our planning meetings are usually detailed enough that my presence at your rehearsal isn’t required unless you have “more choreography than the Moscow Ballet”! Your rehearsal is mostly to rehearse who stands where, says what, and is in charge of what during the ceremony. Most of that doesn’t involve the harpist at all. Your bridesmaids will certainly be able to figure out how to walk with music in the background without having to rehearse it to live music. If you think you really need me at the rehearsal, call me to discuss availability and rates. Taking the harp to the rehearsal will be billed at my standard hourly charge plus any relevant travel expenses. Can you provide amplification for other things, too? I’ve gotten very good over the years at amping harps and musicians, but I’m not really set up for much beyond that scope. How much more expensive is it to have other musicians perform along with harp? It depends on the musician, but a general rule of thumb is that “double the musicians will double the price”. With the exception of The Lakeshore Duet, each one will contract with you individually and quote their own prices. An additional fee will often apply for rehearsal time. If you would like me to work with another vocalist or musician of your choosing, a rehearsal is always required before the date of the event. Who built your website, and how? I’m always flattered when people write to ask me about the website itself. I built it myself (and make no claims to being a web designer). I use a high-end (translation: “expensive but worth it”) graphic design/desktop publishing application called QuarkXPress on my Mac that allows me to lay out the web site much like a piece destined for printing. I tell it how to manipulate the images and text (a far more complex process than you want to read about here) and then QuarkXpress translates the whole mess to HTML automatically. It’s not terribly elegant, but it gets the job done. No, I don’t know HTML. I’m just a graphic designer who likes to experiment! Well, no. In a city that boasts The Eastman School and The Hochstein School as well as several “degreed” harp teachers, I make no claims to being a teacher as such. In a world of “pedigree dogs” I confess to being thoroughly a “mutt” in that I’m self-taught! What works for me may or may not work for anyone else. Harp is really unusual in that teachers almost always hold degrees in harp performance; (I’ve always found it odd that many very respected guitar and piano teachers are simply great at what they do and don’t necessarily hold degrees, the world of harp can be a touch picky.) So no, I don’t “teach”. Now, if anyone wants to learn my “Mutt Technique”, that’s a different story altogether, and anyone thinking along those lines should be forewarned that it will never get you to Carnegie Hall, will never prepare you for international competition, but may well result in more fun and enjoyment than is strictly allowed. There. Disclaimer issued! And no, you’re never too old to learn. Trust me.